Left to Right: Drs. Kelvin Lee (University of Delware), Bill Bentley (UMD BIOE), Steve Cramer (Rensselaer Polytechnic Institute), Jon Dordick (Rensselaer Polytechnic Institute), Mike Betenbaugh (Johns Hopkins University), and Stacy Springs (Massachusetts Institute of Technology). The University of Maryland will be a key partner in a new institute to advance U.S. leadership in pharmaceutical manufacturing that was announced by U.S. Secretary of Commerce Penny Pritzker announced on Friday, December 16, 2016. The National Institute for Innovation of Manufacturing Biopharmaceuticals (NIIMBL) will be the 11th Manufacturing USA Institute, and includes the University of Maryland, College Park and the University of Maryland, Baltimore. A team of more than 150 companies, educational institutions, nonprofits and state governments will operate NIIMBL under a newly formed nonprofit. Unlike most pharmaceuticals, which are manufactured through a series of chemical synthesis, biopharmaceuticals are therapeutics made with living cells. Today, biopharmaceuticals are a mainstay for health care, and include therapies such as vaccines, treatments for cancer and autoimmune diseases, and emerging drugs for cell and gene therapies. The institute will focus on bringing safe drugs to market faster and on developing workforce training. The biopharmaceutical field has a negative unemployment rate, with more jobs available than there are qualified workers. "We frequently tout our world-class universities and their groundbreaking research as we recruit businesses from around the globe to invest and grow jobs in our state," said Maryland Secretary of Commerce Mike Gill. "This new institute reinforces the University System of Maryland’s key role in the areas of biopharmaceutical manufacturing and innovation. Maryland Commerce was pleased to provide strong support for the state’s proposal for NIIMBL." Expected total investment from all stakeholders totals $250 million, including $70 million of federal investment. The demand for disease-treating biopharmaceuticals, which often succeed where traditional drug treatments have failed, is skyrocketing. But, because biopharmaceuticals are made by living cells, they can be complex to manufacture on a mass scale. Whereas production of chemistry-based drugs involves a set discrete number of steps with results that can be replicated over and over, production of biology-based drugs involves thousands more steps with far more variability. Innovations in biopharmaceutical manufacturing will mean more patients have access to the most beneficial therapies. The institute will also help ensure the nation can rapidly scale up manufacturing of these advanced treatments to respond to pandemics and other biological threats, and eliminate drug shortages that can result from quality control issues in manufacturing. The University of Maryland is involved in developing innovative processes and analytical technologies that provide unprecedented connections between the biology in the production system and microelectronics. The University of Maryland’s Institute for Bioscience and Biotechnology Research (IBBR) is a focal point for biotechnology research in the region, being a joint Institute between the University of Maryland College, Park, the University of Maryland, Baltimore, and NIST. IBBR is a unique entity in that it fosters integrated cross-disciplinary team approaches to scientific discovery, translational development and education, creating commercialization relationships and initiatives that serve the expanding economic base of biosciences and technology in the state of Maryland and across the country. 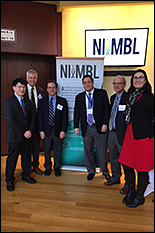 NIIMBL researchers will also work with the University of Maryland Center of Excellence in Regulatory Science and Innovation (M-CERSI), the first federally-supported research center between the U.S. Food and Drug Administration (FDA) and the University of Maryland’s two preeminent research campuses. Scores of Maryland companies have biotherapeutics products regulated by the FDA and rely on standards and measurements enabled by NIST. NIIMBL has also received strong support from Montgomery County, BioHealth Innovation, and many Maryland companies, associations, and community colleges such as Montgomery and Baltimore Community College.